It’s Mothering Sunday and the Trio of Rampaging Rascals are off on a hunt. No, not a Bear Hunt, bears being fairly few and far between in West Sussex, unless you count the Stuffed Variety. Nor an Easter Egg Hunt, which is being saved for three weeks time. I do like to spread out my treats. I’m sure you will never guess so I will put you out of your misery - we are hunting for the Daffodil Heart. See, I told you that you would never guess, didn’t I? The Rascally Trio, their mother (aka the Middle of the Darling Daughters) and their auntie, variously known (by me) as the Youngest of the Darling Daughters and (by the Trio) as Kazza and Honorary Second Mother have all come to visit Mr B and me on Mothering Sunday, bearing cards, gifts, flowers and all the wherewithal to make Afternoon Tea for us all. I have said it before and I will doubtless say it many, many more times - I am well blessed. We decide to take a short trip to beautiful Highdown Gardens, one of Worthing’s best kept secrets, where we hope to see a splendid show of daffodils and other spring flowers. When we arrive, it is clear that the Gardens are not exactly Top Secret - the car park is full to bursting, proof that the World and its Wife are here on this splendid sunny afternoon. We should have known, we tell each other as we circle the car park on the off chance that someone might decide to leave and vacate a couple of spaces just for us. Then we take the thoroughly sensible decision to try the car park at the bottom of the hill and walk up through the park. As we do, we congratulate ourselves and I say that, in future, I won’t even try to park anywhere else. Oh, yes, the Daffodil Heart, I nearly forgot. Within the Gardens there is a heart shaped bed of daffodils which the Youngest of the Darling Daughters and I stumbled across two years ago on a visit to Highdown. The photo of the two of us, standing in the centre of the heart is one of my favourites - as photos go, it says what it does on the tin. If you know what I mean. Fast forward a year and last year we tried to find it again - I believe I documented our search in the Daily Blog. We were fortunate enough to find one of the gardeners working there who led us to the Daffodil Heart, explaining with justifiable pride that it was he who had planted it. Fast forward another year to 2019 and the Youngest of the Darling Daughters has rashly told the Trio that we are going to find the Daffodil Heart. She was, she explained, attempting to inject a sense of fun and challenge to counter the fact that the Trio might have opted for the seaside, given the chance, not understanding that Highdown Gardens and Mothering Sunday are inextricably linked in our (daffodil) hearts. But can we find it? We wander round the gardens in ever decreasing circles but no Daffodil Heart do we find. The Trio are not unduly bothered, having been far more taken with the sight of the tadpoles in the pond, all advancing towards their Froggy Adulthood. The Twins flit about, looking like fairies among the foliage - Lilia is wearing her Halloween witchy-woo outfit, Tala a Princess dress. Which Princess is she, we ask, maybe Princess Ariel? Tala informs us, loftily, that Ariel wears a swimming costume. Wrong again. At least Faris is easily recognisable in his Batman Costume. Apparently the Middle of the Darling Daughters had no part in choosing their clothes for today. Just like their mother when she was a littl’un, I say to myself. We can’t find a gardener, just a fella with a large brass bell which he rings with considerable relish to inform all visitors that the gardens are about to close. No, he didn’t have a clue where the Daffodil Heart might be. We take lots of photographs to record our happy afternoon. 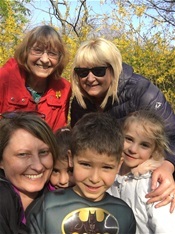 The Middle of the Darling Daughters asks her sister if she might be able to capture some extra special Mothering Sunday pics of her with her children. She seats herself on a bench and tries to gather her Trio neatly around her. Unfortunately the Trio don’t take kindly to being “arranged”- the Twins decide to play hairdressers with their poor Mamma’s locks, twisting them into untidy bunches on top of her long-suffering head. It proves impossible to get all three to look at the camera and smile at the same time. One day my daughter will look back at that photo and won’t mourn in the slightest the fact that it isn’t a perfectly posed photograph of an Ideal Family - but will see it as one which celebrates the very essence of her feisty, quirky Trio.